One Eternal Day: "Real flesh and blood heroes who do something"
The heading for this post is from a 2004 New Yorker article, "Nancy Drew’s Father," quoting the man it was about, Edward Stratemeyer. In 1926, ninety-eight per cent of the boys and girls surveyed in a poll published by the American Library Association listed a Stratemeyer book as their favorite, and another survey showed that the Tom Swift books, which the syndicate launched in 1910, were at the top of the list. Thirty-one series were in full swing. Yet Stratemeyer still wasn’t content. He had noticed the growing popularity in the twenties of adult detective fiction and of pulp magazines like Black Mask, which was founded by H.L. Mencken and George Jean Nathan. .... Stratemeyer saw that this detective fiction, grafted onto an adventure story, might appeal to children. In 1926, the year that S.S. Van Dine’s The Benson Murder Case introduced Philo Vance to the world, Stratemeyer wrote the outline for the first three volumes of a series that proved more popular than any that had come before: the Hardy Boys. Characters should not age or marry. Protagonists of early series such as the Rover Boys, Tom Swift, and Ruth Fielding did grow up and marry, but sales dropped afterwards, prompting the Syndicate to make a rule that characters never marry. 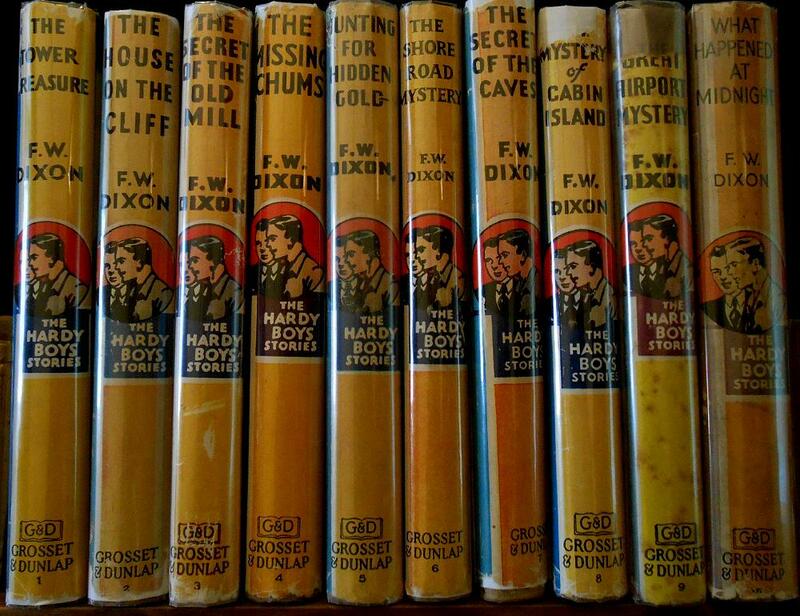 I owned most of the Hardy Boys series in one of the later — updated — incarnations. I once came across an original Tower Treasure and found the earlier version of a by then very familiar story interesting especially because of the dated slang and technology. But the ones I owned had been modernized, eliminating references to "roadsters," etc. My copies are long gone, outgrown and given away. Several of the series are available in electronic form from Gutenberg and ManyBooks. The books are hardly readable as an adult but I did enjoy the Hardy Boys and Nancy Drew a lot when I was about ten. Unfortunately those two series are unavailable free because they are still being sold commercially. Following are some of the early series that can be downloaded without cost and in a variety of formats. There is a caution: in the early books there is some slang and stereotyping that should have been unacceptable then and is definitely so now.